My review of the incredible Alex Machacek, Jeff Sipe, and Matthew Garrison album Improvision has been published at Modern Guitars Magazine. This album has an official release date of September 18th, but you can get it early from Abstract Logix starting August 17th. UPDATE 8/22/07: I've republished my review below. 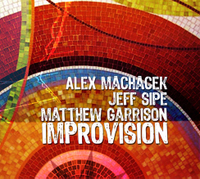 Improvision (Abstract Logix Records) is a collaboration between three of the heaviest musicians on the jazz and fusion scene today; guitarist Alex Machacek, drummer Jeff Sipe, and bassist Matthew Garrison. Simply put, this is one of those rare albums that gets everything right. The playing from all involved is cutting-edge, and the compositions themselves are very deep, yet approachable. A lot of people are going to call this music "fusion". That's not an incorrect label to use for Improvision I guess, since it will get the point across. However, to my ears, this is jazz. Not straight-ahead jazz mind you; it's no-holds-barred, in-your-face, new jazz. Yes, all the hallmarks of fusion are here, at least on most tracks - heavy grooves, distorted lead guitar, advanced harmony, etc. But there's something about the writing on this album that transcends most of the "fusion" I've heard lately. I feel I'll be slighting this music if I use that term to describe it. I don't particularly like labels anyway, especially as they relate to the type of music I'm into. Jazz-rock, fusion, prog-this, heavy-that; in my opinion these terms mean less today than they ever have. Having said that, I'll say this - if Improvision isn't bleeding-edge jazz, I don't know what is. Machacek's last album [SIC] (released in 2006) really put him on the map as a powerful new voice in jazz (ok, ok... jazz-fusion) guitar. While his rapid-fire legato and sweep-picking chops are top notch, it's his deep compositions and heady improvising that set him apart from most guitarists in this genre. Machacek is well know for his projects with drummer Terry Bozzio (BPM, Out Trio, Machacek's [SIC] album). On those projects, and on his first album Featuring Ourselves, Machacek's Frank Zappa influence has been front-and-center on most of the results. On Improvision, that's not really the case. The music here has a looser, less dense feel than his previous recordings, and it's heavily shaped by Garrison and Sipe (after all, this isn't an Alex Machacek-only album; it's a Machacek, Sipe, and Garrison album). Sipe has played in some great bands over the years (Aquarium Rescue Unit, Shawn Lane/Jonas Hellborg, Project Z), and a key ingredient to all of them has been improvisation. He brings that skill to this album with great results. Sipe has a knack for breathing more life into whatever musical situation he is in. And Garrison is a monster. He comes from a rich musical background, and it shows (his father Jimmy Garrison played bass for John Coltrane; his godfather is Jack DeJohnette). In addition to his solo projects, Garrison has worked with John McLaughlin, Herbie Hancock, and many others. His bass parts are the driving force behind many of these songs, and his killer solos should convince anyone that he is one of the premier electric bass players in the world today. Improvision's jarring first track is entitled "There's A New Sheriff In Town". An allusion perhaps to Machacek's current status in the guitar community? It has to be. This piece grabs your attention immediately with some metal rhythms and feedback effects. Before you know it, Machacek unleashes an unrelenting barrage of outside lines (often doubled with guitar-synth) while Sipe and Garrison dig into a heavy groove. If you weren't awake before, you are now. Shifting gears radically, "Along Came A Spider" is a slower piece that features a mesmerizing intervallic melody, and some of the best guitar work on the album. Machacek loads his solo here with highly defined legato runs, and Gambale-esque sweeps. The airy, atmospheric "Shona" has another great melody, and one of Garrison's best solos. "Gem 1" and "Gem 2" has the band in a looser, almost jam-band sort of mode. Sipe's drumming really shines on this tune (it's actually one continuous performance split into two tracks). "Gem 1" has a bit of the guitar/drum doubling that Machacek often did with Bozzio, before segueing into "Gem 2" - the funkiest jam on the album. I love Machacek's rhythmic, bluesy phrasing on this track. You don't hear this kind of playing from him very often. Through all of it, Sipe is the one who seems to be driving the music here. After the beautiful, jazz-meets-classical guitar/bass duet "To Whom It May Concern", things get trippy with "Yoga For Cats" parts 1 & 2. Part 2 reminded me of some of the live improv jams Sipe would get into with Shawn Lane and Jonas Hellborg. It's cool to hear Machacek in a similar situation. There are several slower tunes on Improvision, but the only one I would call a ballad is "Very Sad". This is a heavy, and yes, sad piece of music that really lives up to its title. Garrison plays a beautiful solo on this track. In stark contrast, "Matt's Riff" is the real chops showcase of the album. Everyone is burning on this tune, but this is really Garrison's spot to show what he can do. The final track on the album is "Put Me Back To Sleep". This is practically a straight-ahead tune, and Machacek's solo here really shows his depth as an improviser. Using a more traditional jazz tone, he plays some great lines over the changes, including some nice outside stuff. The thing that strikes me about this album is the sheer depth of the writing and playing. And as deep as the writing is harmonically, it's also very tuneful (I can't get the "Shona" or "Along Came A Spider" melodies out of my head). Though Machacek's guitar is the dominant force on Improvision, the album feels like a true collaboration of these three musicians. It's not just a Machacek album with Sipe and Garrison backing him. This is an extremely impressive recording that is bound to turn more than a few heads. I can't recommend it highly enough.